These findings veer far from the textbook image of how the Earth is supposed to work. Says Roberts of the University of California, Los Angeles, ‘to a theoretician like myself, these results are almost inconceivable’.9 Yet earth scientists lack a firm understanding of the Earth’s magnetic field. According to current theory, swirling currents of molten iron within the Earth’s outer core create a dynamo that powers the magnetic field. It is believed that once every few hundred thousand years, the field flips orientation, swapping north pole for south pole. These so-called magnetic reversals supposedly take about 10,000 years from start to finish. Most geophysicists questioned the original finding. ‘I can’t really understand the mechanism’, says Hoffman of California Polytechnic State University.10 In the face of this conundrum, some geophysicists are trying—so far unsuccessfully—to pin the rapid shifts on something other than the core itself. Critics have thus pointed out that the magnetisation might not be primary; it is not uncommon to find lava flows that have been remagnetised long after they cool, for example, because of chemical alteration. Thus they concluded that the alleged rapid changes in the Earth’s field really reflect an imperfection in the magnetic recording process, an ‘artefact’ according to Bloxham of Harvard University. Similarly, they have convincingly countered other hypotheses, such as that the changes in the magnetisation reflected changes in the external magnetic field associated with, say, a magnetic storm. We may yet all be astonished! Merrill, R. T., 1995. Principle of least astonishment. Nature, 374:674–675. Return to text. Coe, R. S., Prévot, M. and Camps, P., 1995. New evidence for extraordinarily rapid change of the geomagnetic field during a reversal. Nature, 374:687–692. Return to text. Prévot, M., Mankinen, E. A., Grommé, C. S. and Coe, R.S., 1985. How the geomagnetic field vector reverses polarity. Nature, 316:230–234. Return to text. Mankinen, E. A., Prévot, M., Grommé, C. S. and Coe, R. S., 1985. The Steens Mountain (Oregon) geomagnetic polarity transition, 1. Directional variation, duration of episodes, and rock magnetism. Journal of Geophysical Research, 90:10,393–10,416. Return to text. Prévot, M., Mankinen, E. A., Coe, R. S. and Grommé, C. S., 1985. The Steens Mountain (Oregon) geomagnetic polarity transition, 2. Field intensity variations and discussion of reversal models. 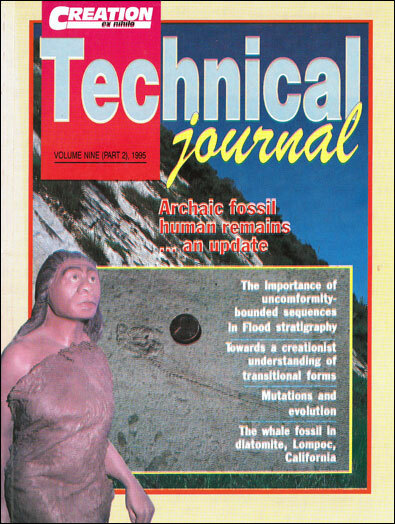 Journal of Geophysical Research, 90:10,417–10,448. Return to text. Coe, R. S. and Prévot, M., 1989. Evidence suggesting extremely rapid field variation during a geomagnetic reversal. Earth and Planetary Science Letters, 92:292–298. Return to text. Merrill, Ref. 1, p. 674. Return to text. Coe et al., Ref. 2. Return to text. Monastersky, R., 1995. Earth’s magnetic field follies revealed. Science News, 147:244. Return to text. Appenzeller, T., 1992. A conundrum at Steens Mountain. Science, 255:31. Return to text. Appenzeller, Ref. 10. Return to text. Monastersky, Ref. 9. Return to text. Humphreys, D. R., 1986. Reversals of the earth’s magnetic field during the Genesis Flood. In: Proceedings of the First International Conference on Creationism, R. E. Walsh, C. L. Brooks and R. S. Crowell (eds), Creation Science Fellowship, Pittsburgh, Pennsylvania, Vol. 2, pp. 113–126. Return to text. Humphreys, D. R., 1990. Physical mechanism for reversals of the earth’s magnetic field during the Flood. In: Proceedings of the Second International Conference on Creationism, R. E. Walsh and C. L. Brooks (eds), Creation Science Fellowship, Pittsburgh, Pennsylvania, Vol. 2, pp. 129–142. Return to text.